This pure CBD nourishing bath bomb is all you need to get that beauty sleep you always fantasize about. It is produced with the purest laboratory tested cannabis and essential oils. 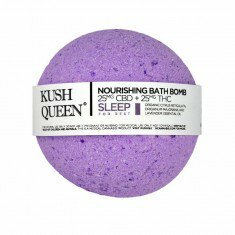 Kush Queen Bath Bombs are 100% hand-made and 100% organic. This Sleep Bath Bomb contains organic citrus reticulata, origanum majorana, and lavender essential oil. The pigments of Kush Queen’s Bath Bombs are derived from food coloring. This means it contains no artificial dyes or preservatives or fragrances and is absolutely safe for absorption. Permeate a filled tub with this lovely bath bomb, immerse and let it take care of the insomnia. It is highly recommended.